Ask ten different people what their idea of the perfect car is and you're likely to get ten different answers. It's this philosophy that the 2009 Mazda RX-8 banks on – much like the lone Gothic kid stuck in an honors literature class with a bunch of Abercrombie-wearing middle-class lookalikes, the RX-8 is different for the sake of being different. While there’s been a mild exterior refresh, it retains the trademark love it or hate it 1.3-liter rotary engine from the previous model. Gone is the somewhat timid outward appearance of the previous RX-8 thanks to the R3 sport package, which adds a rear spoiler, hard-hitting 19-inch wheels, side sills, fog lamps and some serious Recaro sports seats. Underneath it all, however, lies the same lithe, agile chassis and pointable helm automotive critics the world over have adored since the RX-8’s debut in 2003. This ninja’s still a ninja, albeit with a shinier sword. The low-inertia rotary engine loves to rev, and you’ll love revving it halfway to the moon. Rear half-doors that reverse open provide convenient and easy access to an otherwise cramped rear seat. The R3 package adds some aesthetic aggression to the otherwise clean-looking RX-8. A consequence of the rear half-doors is a chunky C-pillar that limits over the shoulder visibility. Rotary engines are notoriously thirsty creatures (with an appetite for both gasoline and oil), and this 1.3-liter engine returns small V-8 fuel economy as a result. While the Recaro seats provided by the R3 package are amazingly supportive, like all racing seats they can literally become a pain during long hauls. The key to the RX-8’s performance is its lightweight, compact design. Its engine’s peaky powerband relies on high rpm power, and with relatively meager amounts of torque on hand and a limited slip differential, it’s no powersliding hero. Rather, its ride is smooth and controlled, allowing you to get deeper into the throttle earlier in the corner, exploiting the chassis’ superb balance to the fullest extent. Maintaining momentum quickly becomes your goal, though when you do have to slow down the brakes shed speed with confidence. The gearshift is a particular highlight, with every crisp, notchy shift coming through like a bullet into the chamber. Rather than employ a shift light to warn you the engine’s reached its upper limit, the Mazda does something more unique, letting loose a single “beepâ€ that’s somehow neither overly shrill nor muted under the peaking engine note. Cylinders? We don’t need no stinking cylinders! The RX-8 is powered by a 1.3-liter twin-rotor RENESIS engine – picture a triangle rotating about a central axis within a combustion chamber to create power. The six-speed manual puts 232 horsepower and 159 lb-ft of torque to the rear wheels, revving to a cataclysmic 9,000 rpm. A six-speed, paddle-shifting automatic is also available. Automatic transmissions, however, are limited by their rotational speeds and produce only 212 horsepower with a 7,500 rpm redline. Needless to say, go for the three-pedal setup. The RX-8’s signature reverse opening half-doors (similar to those available on extended cab pickups) add convenience to the RX-8’s list of accolades, while somehow blending well with the coupe’s styling. When the engine is cold, red lights beginning at 5,000 rpm on the tachometer are illuminated to keep you from over-revving the engine. They are similar to the items found on the E46 M3, and slowly disappear as the engine heats up. The RX-8’s main focus is on performance, but the typical modern comforts are still up for grabs. A 300-watt, nine-speaker Bose sound system with optional SIRIUS satellite radio is on tap should the drone of the rotary engine begin to wear on you, and a keyless entry system with an ultra-thin key fob will keep you from digging your keys out of your pocket every time you enter the car. Fuel efficiency is clearly the RX-8’s Achilles’ heel. While the rotary engine packs plenty of horsepower bang for your displacement buck, it does so at a price – rampant fuel consumption. 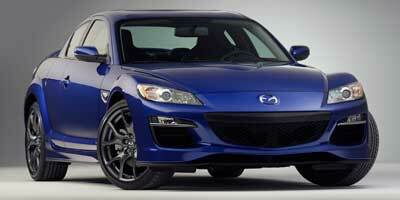 The EPA gives the RX-8 a lowly 16 mpg city and 22 mpg highway (23 for the automatic) estimate. Compare that to the 16/26 achieved by a Corvette and you start to get the picture. The engine achieves an LEV-II rating. The unique interior design of the RX-8 continues over to the new model, centered around a circular stereo fascia. Only black leather, gray seat inserts and red stitching are available, but that’s not a bad thing. An odd choice is the wrap-around trigger guard attached to the emergency brake. A real highlight of the R3 package is the aggressive 17-inch anthracite rims. Thinly wrapped in low-profile rubber, they fill out the wheel wells and, along with the side sills, rear wing and burbling twin-exhausts, give the RX-8 a hunkered, sinister look. The R3’s MSRP of $32,600 might scare away some RX-8 fans, but an RX-8 Sport can be hand for a more reasonable $27,105, The most direct competitor would be the $28,600 BMW 128i, but the R3 is undercut by more powerful coupes such as the $28,510 Nissan 350Z, $29,820 Dodge Challenger R/T and $24,723 Ford Mustang GT. As all niche vehicles go, the RX-8 is a love it or hate it car, mostly due to its off-the-wall rotary engine. The compact powerplant is what allows for the car’s superb balance and agility, but some simply won’t be able to acclimate to the engine’s peaky powerband. Still, few chassis come as well polished as that of the RX-8, and if you can learn to live with its unconventional mannerisms, you’ll be rewarded by a sublime driving experience.